Thame United was formed in 1883 making it one of Oxfordshires’ oldest clubs. Its early years were spent in Oxfordshire Leagues and in 1906, 1909 and 1910. 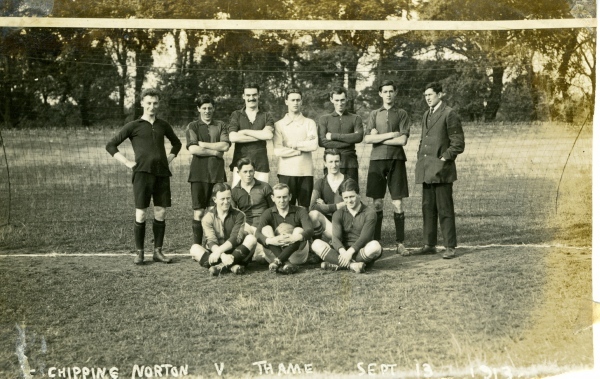 Thame won the Oxfordshire Senior Cup and the Senior League in 1907, 1908,1910, 1930 and 1931. A switch to the Hellenic League then brought further success culminating in the Hellenic League title in 1961-62 and 1969-70, as well as being runners up in 1960-61, 1976-77 and 1980-81. The Oxfordshire Senior Cup was won in both 1976 and 1981, but a poor spell in the mid eighties preceded a crossing of the pyramid in 1988-89 to join the South Midlands League. The Club finished runners up in both 1988-89 and 1989-90 before eventually winning the title in 1990-91. Thame received the green light to join the Diadora League in 1991/92. 1994-95 saw the Club win the Division 2 Championship with 93 points – an 11-point margin. In 1995/96, the Club reached the 3rd Round Qualifying in the FA Cup and the FA Trophy. In the league we finished a creditable 13th in our first ever season in the Isthmian League Division One. Andy Sinnott was appointed first team manager in June 1997 and, with a dramatically reduced operating budget, the side were relegated into Ryman Division Two. The Club bounced straight back into Ryman Division One and reached the semi-finals of the FA Vase. 1999/2000 saw the Club come within two points of achieving promotion to the Premier Division. In the 2000/2001 season the team lead the way for most of the season, putting together a club record of 12 consecutive wins, but a slump in form in the latter part of the season resulted in a 5th place. A mid-table finish followed in 2001/2002 season but the Oxfordshire Senior Cup was retained. Mark West was appointed player/manager when Andy left United during the summer of 2003. In October 2003 the club reached the 4th qualifying round of the FA Cup for the first time in its history, before being beaten 1-2 by Conference side Farnborough Town. After a mid-table finish the Club moved to the newly formed Southern League, Division 1 West. In October 2004, the Club again reached the FA Cup 4th qualifying round and finished the season 11th in the league. Mark West left to join Slough and defender Tony Joyce was appointed player /manager. By July 2005, the Club was in financial trouble and, following a visit from Bailiffs acting on behalf of HMRC, the landlord enforced a clause in the tenancy agreement and evicted the club from Windmill Road. A ground share agreement was reached with neighbours Aylesbury United and, with the side struggling at the foot of the Southern League Division 1 West, Tony Joyce resigned in December 2005, with a new joint managerial partnership of Richard Searl and Alan Thorne appointed. Relegation to the Hellenic League was confirmed later in the season. A ground share agreement was reached with AFC Wallingford for 2006/07. Mark West returned to the Club mid-way through the season but could not save the Club from relegation to the Hellenic League Division 1 East. The 2007/08 season provided greater stability for the Club, with Mark West and new assistant, Frank Thompson, looking after first team affairs. A mid-table finish resulted, which was followed by a ninth placed finish in 2008/09. 2009/10 saw the Club win the Division 1 East title by six points and reclaim their place in the Premier Division. The 2010/11 season was the most significant in the Club’s recent history. With work on the new £3.1 million ground at Meadow View Park commencing in March 2010, United returned to Thame in December 2010, just over five years after theirforced eviction from the town. Boasting eight pitches, a floodlit 3G training pitch and a 8000 sq ft clubhouse, United now have one of the best sporting facilities in the Hellenic League. The official opening, against Oxford United in January 2011 saw a record crowd of 1,382.